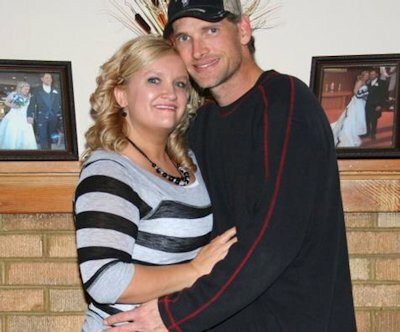 Meet your neighbors Kenny and Tiffany Foster of La Harpe. Kenny was born on September 20, 1974 and raised in La Harpe. He is the son of Debbie Lee and Ken (Carron) Foster all of La Harpe. Debbie owns Pesty Lady Pest Control and Ken and Carron own and operate K & C Enterprises along with friend Lenus Duffie. Tiffany was born on January 3, 1979 and was raised in Nauvoo. Tiffany is the daughter of Carmen Jackson of La Harpe. Carmen works for Thomas L. Cardellas in Keokuk, Iowa. Kenny and Tiffany met in 2004 and were married on April 21, 2006 at the La Harpe Christian Church. Kenny is currently working on opening a taxidermy and hydrographics business in La Harpe. Tiffany is a Licensed Practical Nurse and works for Mobile Nursing Services, Ltd. In the past Kenny was in the military for 8 years. Tiffany owned and operated a daycare in Nauvoo for several years. When Tiffany decided to attend nursing school, she closed her daycare and became a part-time bus driver for Nauvoo-Colusa School District. Kenny and Tiffany have 4 sons and a daughter. Three of their children, Camryn Marshall, 14, Cody Marshall, 11, and Abigail Foster, 6 live in La Harpe. The two older boys, Austin Foster, 17 and Dominick Foster, 14 live in Dallas City. Kenny has one sister, April Jones, who lives in Keokuk, IA, with her husband David, and their two daughters, Jenny and Haley. Kenny has another sister, Misty Deanne Foster who passed away in 1974. Tiffany has a sister Amanda Savage who lives in Keokuk, IA, with her husband, Dustin and their five daughters, Emma, Lily, Schuyler, Shelby and Summer. Tiffany also has another sister, Carlie Jackson, who lives in La Harpe. Tiffany has enjoyed being an assistant pee-wee/t-ball coach in La Harpe for the past two years. This year, both Kenny and Tiffany will coach their daughter's t-ball team. Kenny and Tiffany enjoy spending time with their children, whether they are cheering them on during sporting events or hanging out with them at home. They love the outdoors and both of them are avid bow hunters. A couple of the children also have bows and go hunting with them as well. They both love classic cars and 4x4's. Kenny has been a drummer for many years and has played with many bands in the area. He has performed in shows all over the United States. Tiffany enjoys being a freelance photographer (Views by Tiffany) and playing the piano.